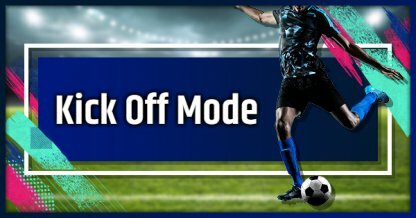 Check out the all new Kick Off mode! Learn about the new match types, house rules, available teams, stats tracking, & more! Kick Off is FIFA's classic one-match game making it the ideal casual game mode. 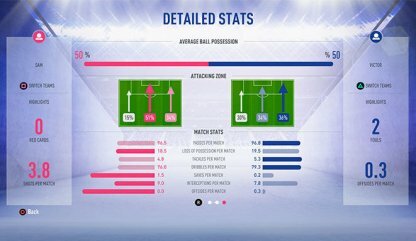 In FIFA 19, additional match types have been added to spice up the Kick Off experience. 5 new match types have been introduced to the Kick Off mode in addition to the Classic Match. 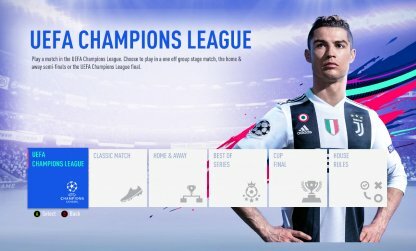 Set up a match in the Group, Semi-Finals, or the Champion League Final complete with signature UEFA visuals, rules, and more for an immersive experience. Setup unique rules (or even no rules!) to spice up your matches. There are 5 modes you can enjoy! Play 3 or 5 matches against the AI or friends to determine an overall winner. A 2-game match where a home and away game are played. Overall score is determined by the combined score for both games. Experience the cup final of matches from around the world, some of which include authentic broadcast experiences. Each time a goal is scored, a player is removed from the scoring team (except the Goalkeeper) to increase the level of difficulty of the match. There is no rules set! Do not worry about penalty cards! Goals scored from outside the Goal Box count as two goals. Set the number of goals required to win the match for 1 to 3. Match clock time and penalties will also apply, if you enable them. Except for free kicks and penalties, only goals scored via headers and volleys will be counted. Kick-Off now tracks your stats so that you can get an overview of how you have performed so far in this game mode. Use these to plan your strategy and see where you need to improve. What Teams Can You Play? All teams are available in the game can be use to play in Kick Off mode regardless of league that they belong to. The only restriction is that you CANNOT pit a Women's Team against a Men's Team.